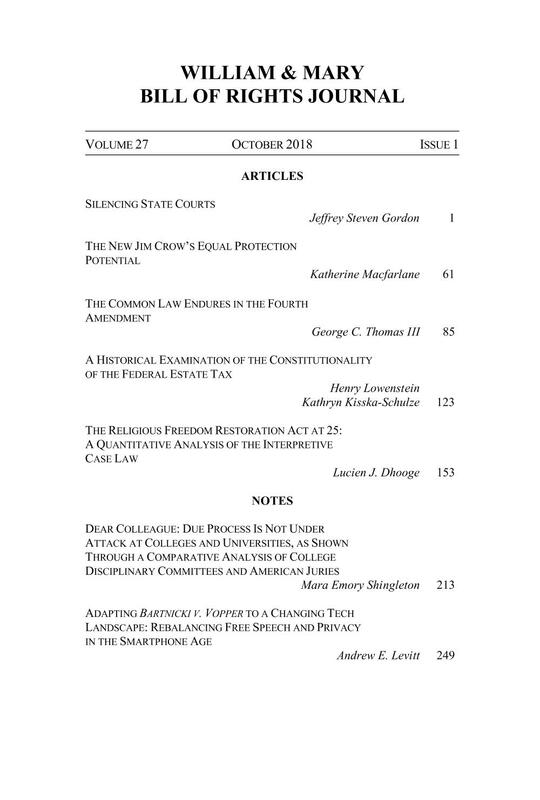 The Bill of Rights Journal’s newest issue has just been released! The table of contents is below and PDFs of all the articles and notes can be found Here. All content is also available at Hein, Lexis, EBSCO, Westlaw, and the W&M Repository. This year’s Symposium will take place Friday, March 15th from 12:30 PM to 5:30 PM and Saturday, March 16th from 9:15 AM to 12:30 PM at William & Mary Law School. The theme of the Symposium is “Constitutional Rights: Intersections, Synergies, and Conflicts” which will feature an impressive lineup of Constitutional Law scholars. Three panels will be held on Friday and the Symposium will resume Saturday morning with a light breakfast and two additional panels. If you plan on attending this free event, please Click Here to register. Named among the leading student-edited constitutional law journals by Washington and Lee’s law library, the William & Mary Bill of Rights Journal is published in four issues per annual volume, adding almost 1,400 pages to the Institute’s scholarly corpus each year. Containing both student-edited professional articles and student-written notes, staff membership is open to all interested students, but the competition for admission is intense. Each year, as the Institute sponsors symposia on topics of contemporary constitutional significance, leading scholars from around the nation assemble at the School of Law to present papers and debate their merits. Subsequently, these papers are published in the Journal, making these symposia one of the most significant academic forums for the publication of scholarship on the Constitution and the Bill of Rights.